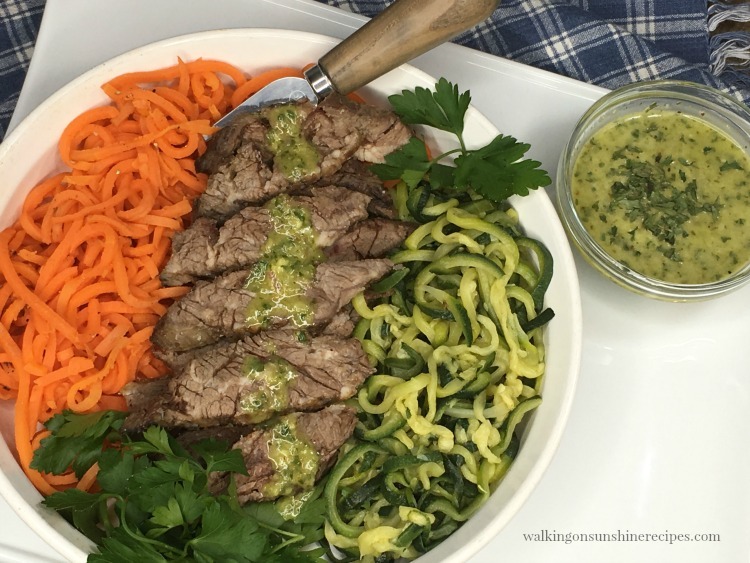 Grilled Steak with Zucchini Veggie Spirals with homemade chimichurri sauce are definitely on the menu for dinner this week! 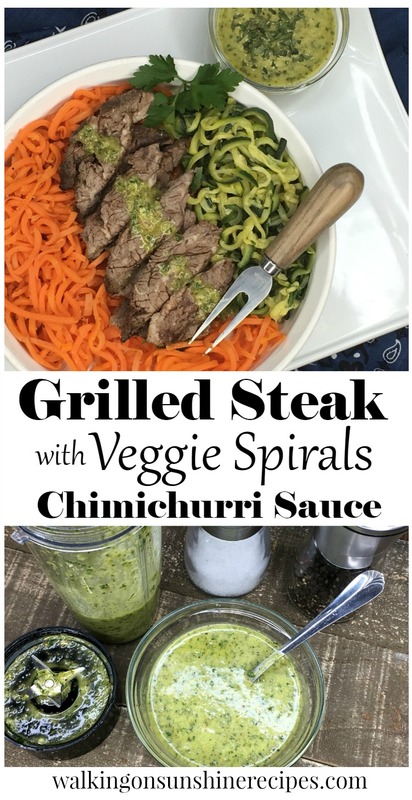 This week on the menu is this easy recipe for Grilled Steak with Zucchini Veggie Spirals and Homemade Chimichurri Sauce Recipe. Zucchini and Carrot Veggie Spirals are the perfect swap-in for recipes where I would normally use pasta or potatoes as a side dish. How are you doing with your New Year’s resolutions to eat healthier and prepare more meals at home? Things are going pretty good for me. 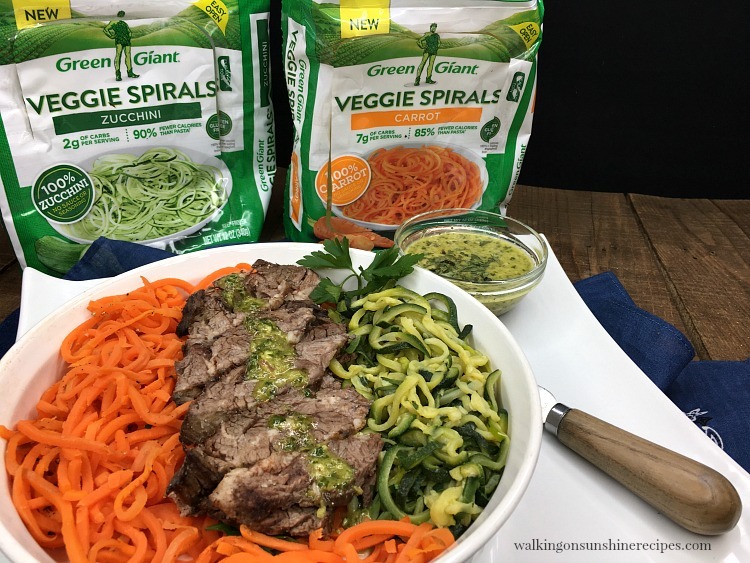 I’m using the Weekly Meal Plans I post here every Monday to plan out dinner for my family AND I’ve been making wiser choices with eating healthier…especially with these Green Giant® Veggie Spirals. Made with 100% vegetables, new Green Giant® Veggie Spirals have up to 90% fewer calories than pasta, making them the perfect swap-in when you’re trying to watch your caloric intake. Veggie Spirals are gluten free and come without sauce or seasoning so you can prepare them just the way you like. Which makes them perfect to serve as a side dish with grilled steak and homemade chimichurri sauce! 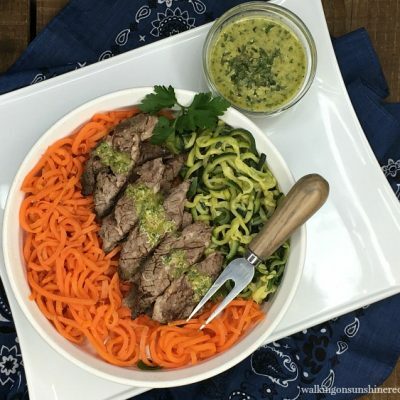 For this recipe I chose to use both the Zucchini and Carrot Veggie Spirals to serve as a side dish for one of my family’s favorite grilled steak recipes. 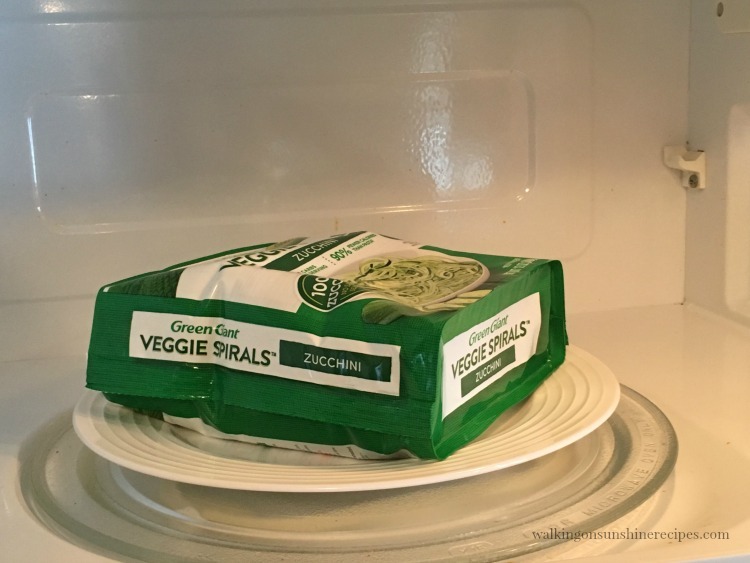 Cook frozen veggie spirals on the stove top or microwave directly in the packaging. Drain the veggie spirals well in a colander to get rid of excess water … just like you would with regular pasta! I chose to microwave both packages following the easy directions provided on the back of each package. In just a few minutes they were done. 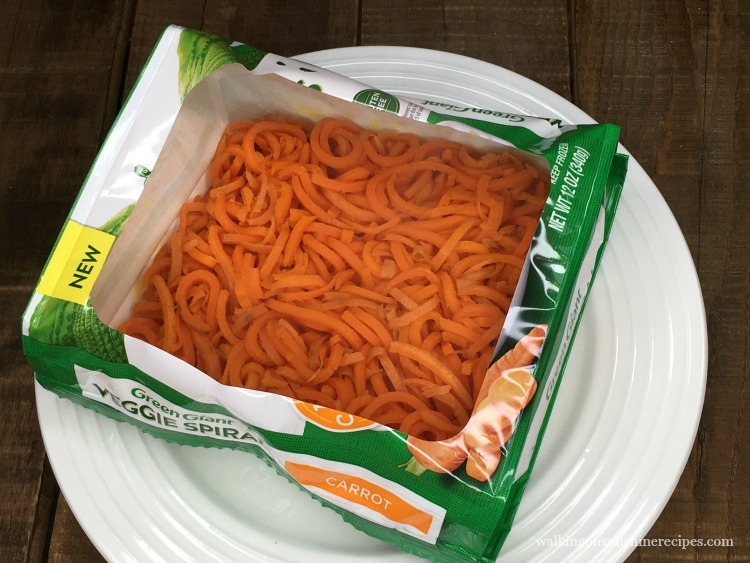 The Carrot Veggie Spirals didn’t need to be drained at all. So once they were cooked in the microwave again, I set them aside while the steak finished cooking. This is a really easy recipe to put together and gives so much flavor to the steak. 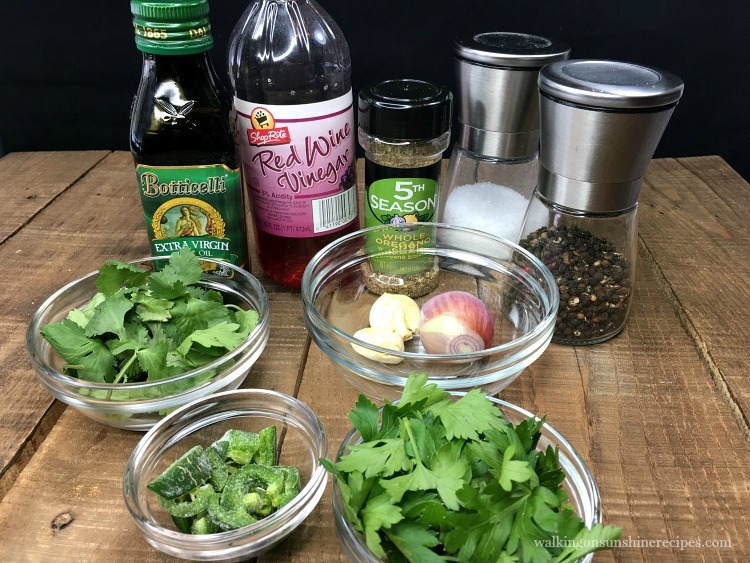 Quickly blend the ingredients together using a blender and set the sauce aside until the steak is finished cooking and you’re ready to assemble the steak and veggie spirals. 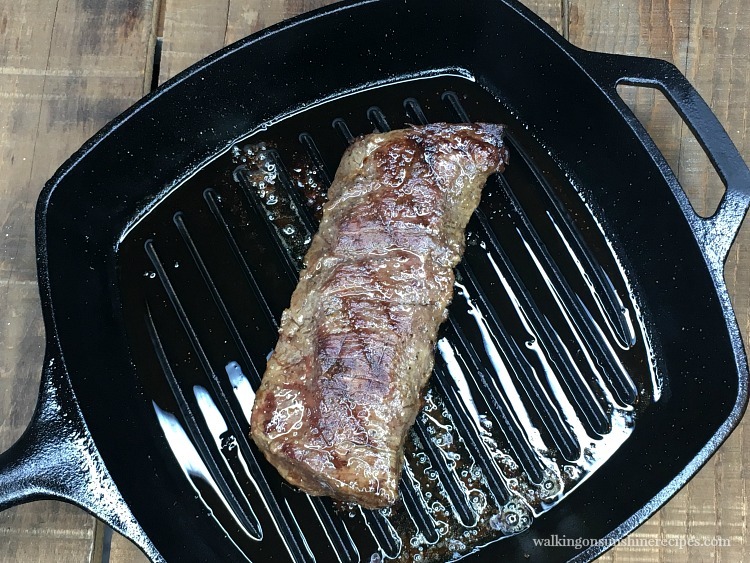 I love to cook my steak in my cast iron grill pan. I only seasoned the skirt steak with my House Seasoning that I love to create and keep in a mason jar by my stove. Once the steak is done, slice it thin against the grain. 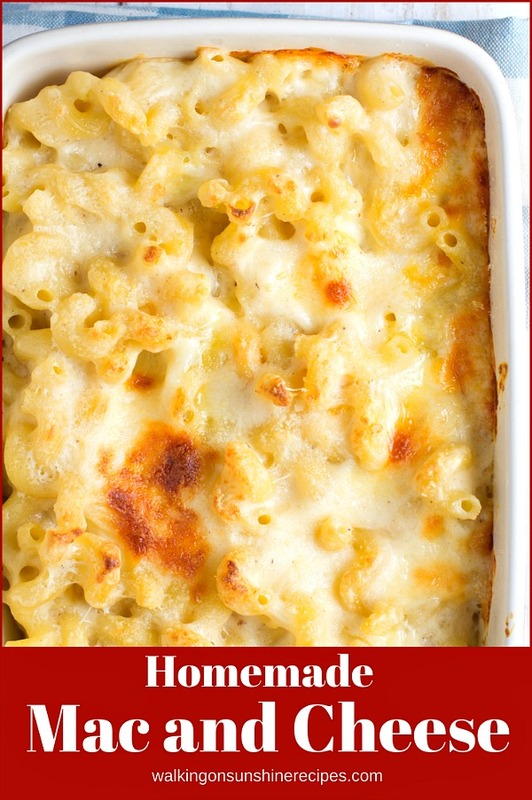 For this recipe, I decided to serve everything in one platter…sort of like a bowl recipe. I layered the Carrot Veggie Spirals on one side and then the Zucchini Veggie Spirals on the other side. Then I laid the sliced skirt steak down the middle. Finally I drizzled the Homemade Chimichurri Sauce over the steak and served the extra sauce in a small bowl alongside for dipping. Here’s a closeup of our dinner. It was delicious! I loved having the Veggie Spirals in place of pasta. 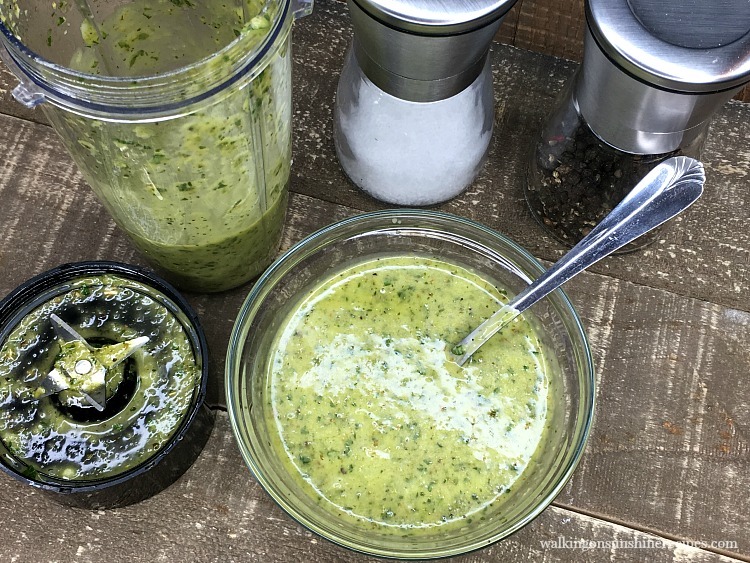 Garlic and spices combined to make a tangy sauce to serve on top of grilled meat...and yes, it's green! Combine the garlic cloves, shallot, jalapeno pepper in a blender or food processor and blend for a minute. Add the cilantro and parsley, oregano and salt. Blend for another minute. Add the vinegar and oil. Blend until everything is completely combined. Spoon sauce over grilled meat. Store unused sauce in an airtight container one to two weeks in the refrigerator. I buy those 2 veggie spirals since i don’t have a spirilizer. Birh the steak and chimichurri look so delicious. This was my first time trying them and I can definitely see making them again. So easy and no mess to clean up. Thanks Denise! Quite an exotic treat to try. Well, exotic for my limited cooking skills anyway haha thanks for sharing! LOL. I do think the spirals look cute too. Thanks! I can’t wait to try try these, I haven’t made my own because the idea seems hard…so I love this!! So easy and so delish!!! Exactly why I tried them too! Thanks for visiting! I can already tell this is going to be my husband’s favorite meal! Knowing he’s getting more veggies in makes me happy too! My husband really enjoyed the veggie spirals too. He actually had a second helping of the carrots…which usually never happens. Thanks for visiting Crystal! Finally, I can have fancy meals too, without the mess and time of trying to make my veggies look like that. I can pretend I made them all into spirals myself! 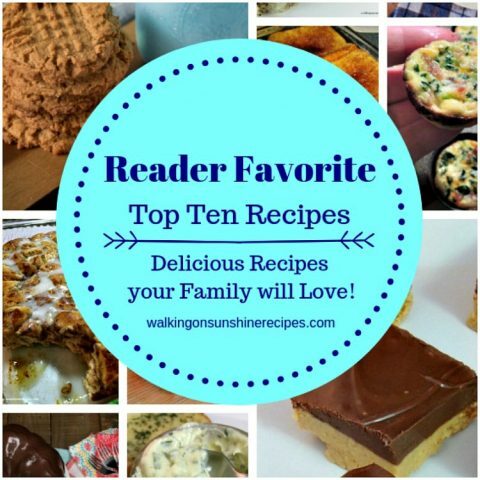 I love easy recipes too! Thanks for visiting Kristi! This looks so delicious! I’ve been wanting to try veggie spirals for the longest time but I’ve been intimidated by them. The way you prepared them looks so easy so I’m definitely going to give this a try. Thanks for sharing! Same here…which is why I was so happy to find them also. Hope you enjoy them! This is the best idea ever! I make veggie spirals all the time. We love them, but it’s a pain to drag out my spiralizer. This is so much better! I know! Same here! Hope you try them soon! Oh my gosh!! 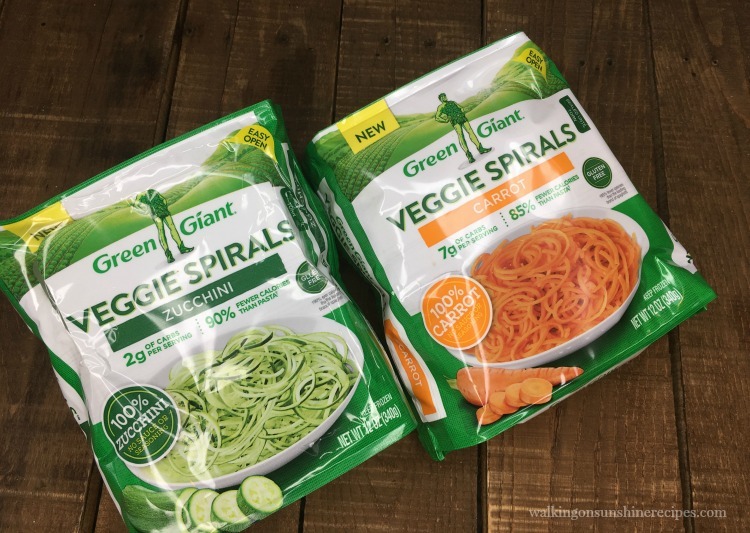 I had no idea Green Giant made veggie spirals. My husband and I are vegan (he cheats!) and vegetables are a huge part of our meal plans. Thanks so much for the heads up! 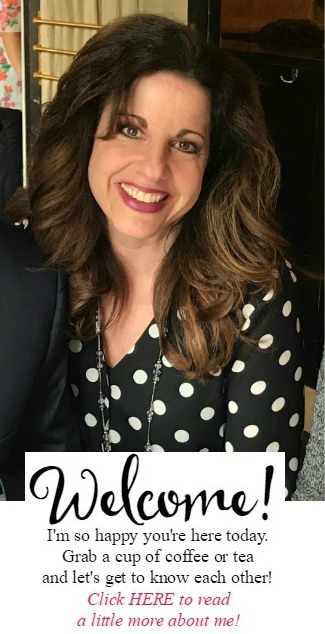 Oh, I’m so glad you stopped by to see this post! Hope you enjoy them as much as we did. I haven’t had steak in so long, you’ve made a steak meal looks absolutely delicious. I am going to have to try this for sure. 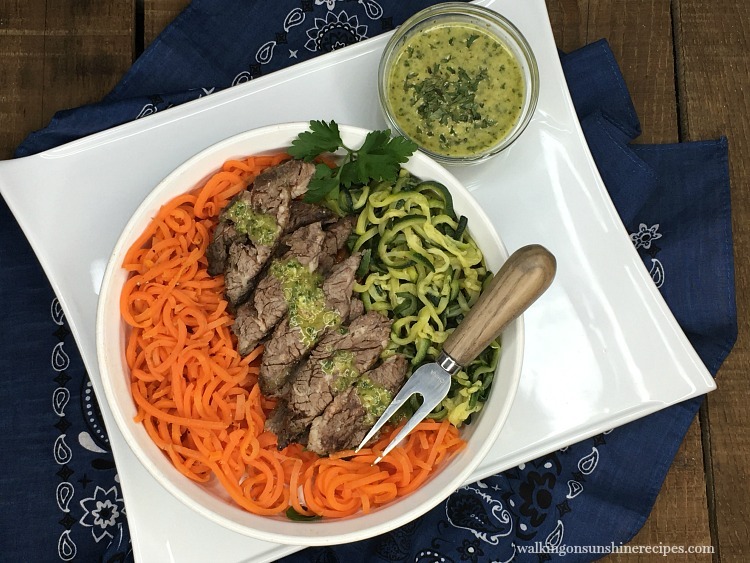 I love the idea of having zucchini veggie spirals with steak for dinner with the fam! Thanks Brandy. Steak is something we only enjoy very rarely as well. I can say with conviction that this was delicious.